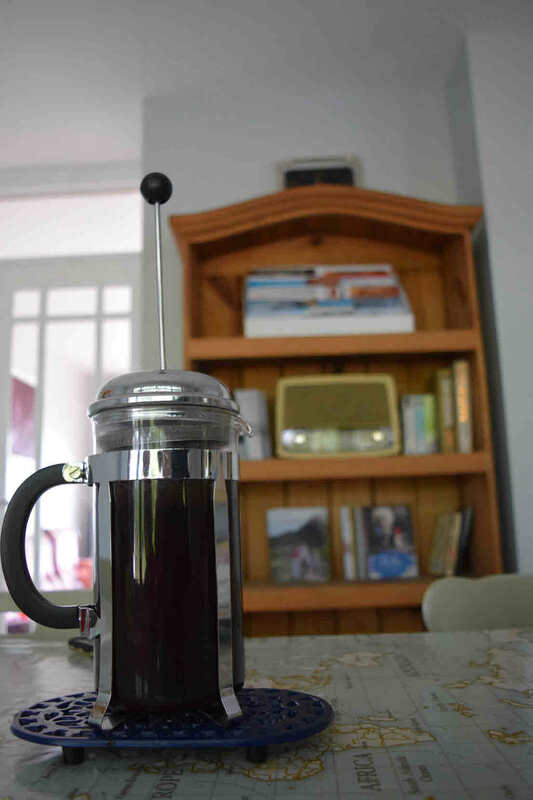 Welcome to Blas Ealaíne (a taste of art). Here you find a taste of Irish art made by local artists. 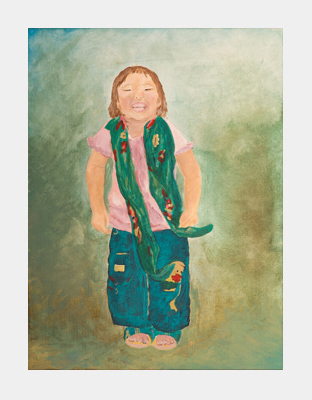 We also have high quality prints and stretched canvas prints available for most of our paintings. We make our own custom frames using real wood and we also do handmade crafts. Dónal and Bronagh founded Blas Ealaíne in 2012. 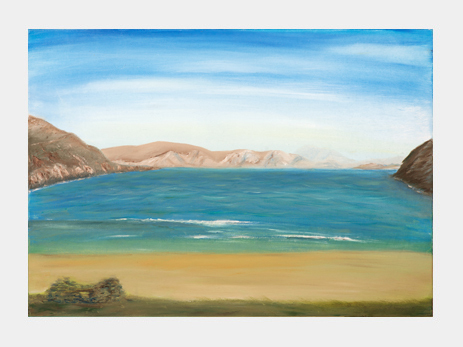 Paintings of landscapes, people, sport and others can all be found here. Have a look and enjoy!. 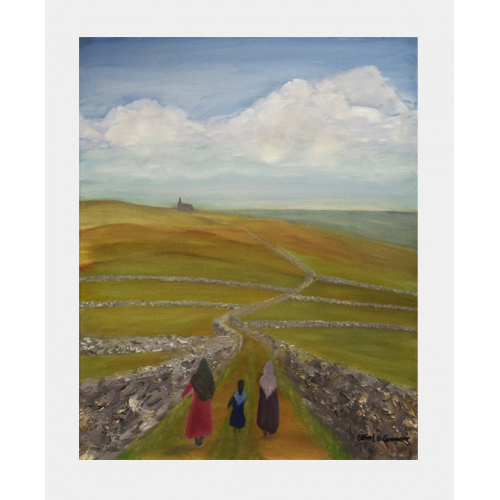 If you would like to buy any of our paintings, or order a comissioned painting, or a copy of one of our existing paintings, get in touch with us. 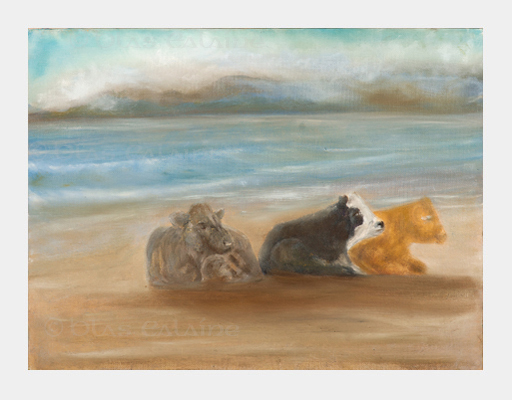 As well as paintings, we also do prints of our paintings, traditional wooden crafts and bog oak carvings, as well as greetingcards in Irish and postcards with Irish proverbs, with our artwork. 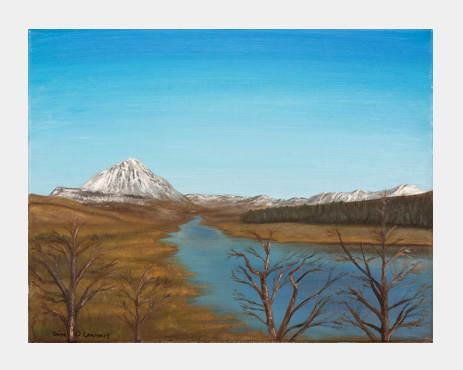 Bronagh has been painting in the medium of oil for a number of years now. 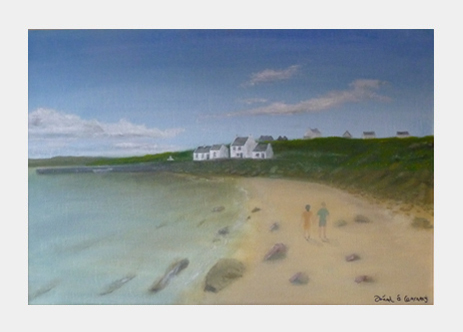 Rasharkin (Co. Antrim) artist Tommy McGoldrick was first to introduce her to this expressive medium. 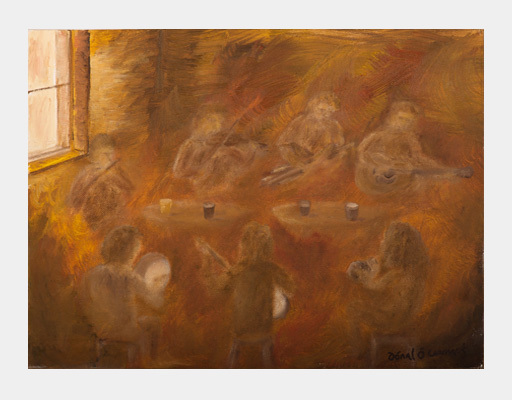 Bronagh enjoys capturing the essence of Irish life on canvas and concentrates on what the people, landscapes or sport has to offer. 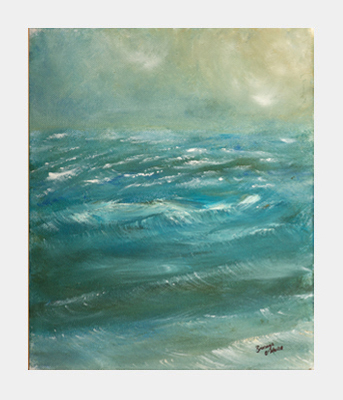 Daniel has been painting in the mediums of acrylic and oil for a number of years. His sister Karen has been his inspiration from a young age. As an extremely talented artist herself, Karen has nutured Daniel's artistic talent. 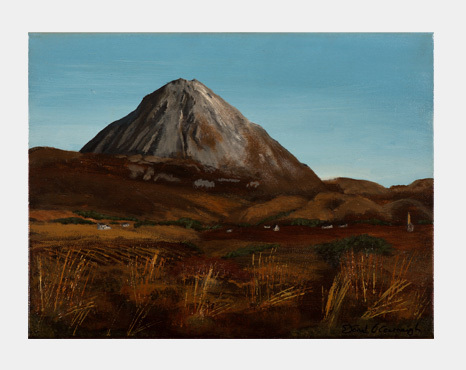 On top of that, he attended classes with the well known Belfast artist Tony Bell. 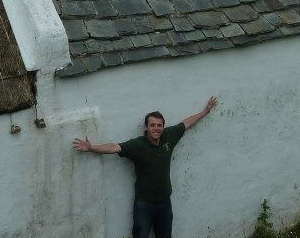 Daniel enjoys capturing the beautiful Donegal houses, landscapes and islands. Three years after taking the photo and not knowing at the time who Míci MaC Gabhan was, Daniel went on to do a degree in Irish where in the 2nd year of the degree they would study a book on a local Irish writer in Donegal in the early 1900s and of his ups and downs of life. The book ‘The Big Wheel of Life’ was written by none other than Mící Mac Gabhan! When my oldest brother Columba was young, the family went to Moville, County Donegal and looking upon Magilligan Point, County Derry, Columba thought to himself that it looked like ‘Indian Country’ from western films. We were there together on a hike in 2004 and I took the photo with a phone. I used acrylic to paint the picture. I was on Sleeve Leag, County Donegal with my brother Martin and my friend Aonton took a photo of us from another point in the cliffs. We used to go hiking often together . 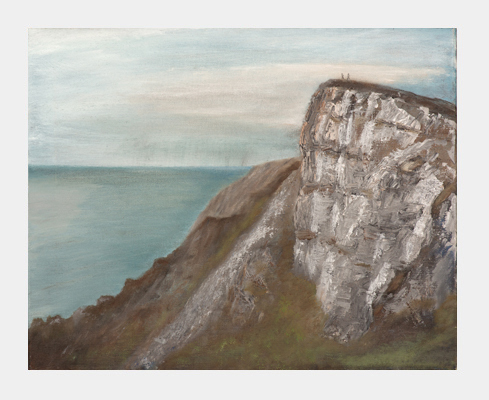 When I started art classes with Tony Bell in An Droichead in 2009, I did this painting first. I was at the top of Errigle 7 or 8 times as I love this mountain and area. It seems to change appearance every time I see it. I did three versions: one without clouds and with gloss, one with clouds and without gloss and one bigger version, all with Acrylic. Interesting fact: Errigle used to be a volcano thousands of years ago. Reason for Visit Dónal took his mother and girlfriend Bronagh on a weekend Gaeltacht trip with An Droichead in 2011 during the winter, stayting in Glassagh spending the weekend doing some walking and talking in Iirish. 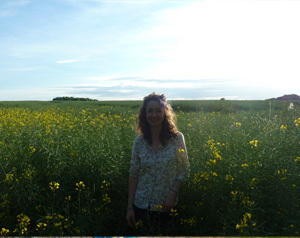 When they went home again, they stopped on the banks of the river Clady for a short time. Photo Dónal took a photo from the banks of the river with Errigle and a cuple of hills in the background under snow and the river and a couple of bare trees in the foreground. Inspiration for Painting Dónal painted the picture for his younger brother Brendan, because Brendan really liked the photo and they both spend time in that area hiking. Interesting Fact Errigle used to be a volcano thousands of years ago, hence its shape and is part of the Seven Sisters, which include Muckish, Crocknalaragagh, Aghla Beg, Ardloughnabrackbaddy, Aghla More, Mackoght and Errigal which Dónal and his brothers hiked a number of times as part of The Glover. 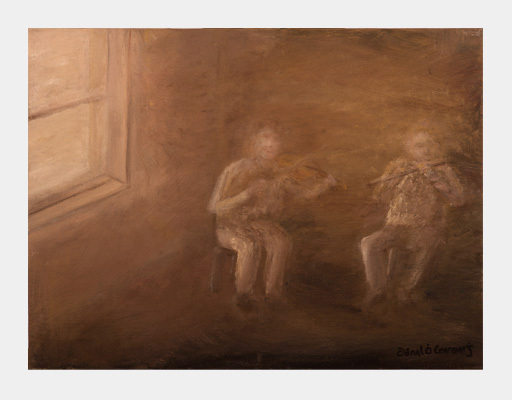 When I started art classes with Tony Bell in An Droichead in 2009, I did this painting first. I did three versions: one without clouds and with gloss, one with clouds and without gloss and one bigger version, all with Acrylic. 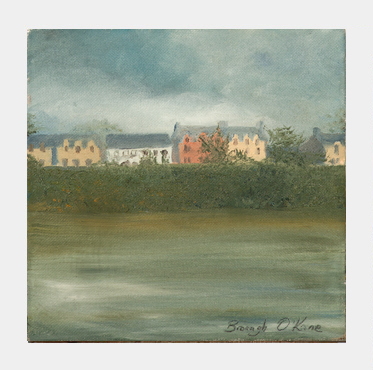 The first oil picture I painted since I was at school in County Derry. 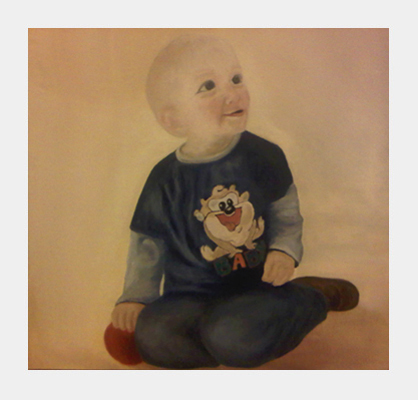 I was living with my friend Clare Brady another young artist when I started this painting. The Ness (waterfall) is situated a couple of miles in from the area where I was born and rared in County Derry and it’s said that it’s one of the largest waterfalls in Ireland. 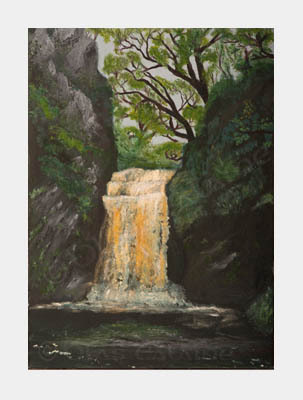 There’s also a historical story about Shane Crossagh Ó Maoláin, a raporee from the area, where he jumped the large gap at the top of the waterfall to escape capture from soldiers who were in pursuit. 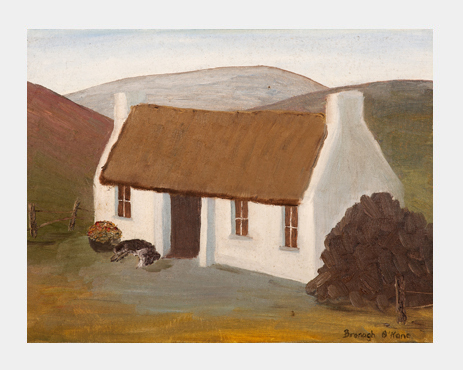 One of my first paintings i did from my head when i was in my teens, with a fictional cottage and a dog outside at the door. When i first heard this poem by Máirtín Ó Direáin being read in my Irish class I immediately thought that it would make two good paintings. 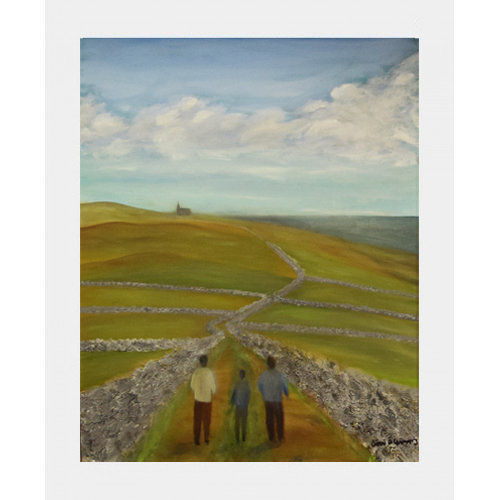 There are two verses, the first verse describing what the men wore on their long walk to Mass on the Arann Island, and the second describing what the woman wore on the same long walk. I started the paintings in 2012. Máirtín Ó Direáin passed away in 1988. It’s also a social document of the time of life on the Áranns, describing the clothes worn, their believes (to make the long walk) in some cases where the cloths were made or sources and the fact that the men and woman were almost in two separate groups. 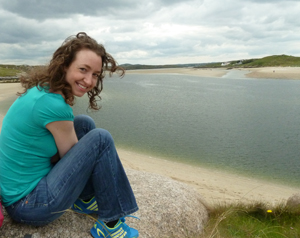 When we were young, our sister Marie took us to Kinnagoe Bay, County Donegal, for the first time where we had a great day there. Interesting fact: The boat La Trinidad Valencera sank there in 1588. 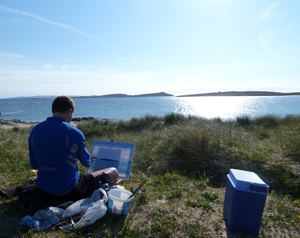 We visited Achill Island in April 2014 and stayed on the beach at Keem in a tent and painted a few pictures. It’s a lovely, quiet beech with stunning views with Croke Patrick in the background. I added an old house into the picture – an old house from one of many from the Deserted Village in Slievemore (also Achill) a couple of miles from Keem. 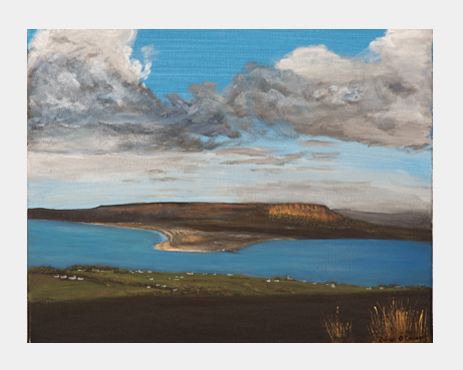 When Donal wanted to do a painting for his dear Bronagh he decided to paint Inis Meáin with the two of them on it, as its their favourite area in Ireland, the Donegal Gaeltacht. Dónal and Bronagh later got engaged on Inis Meáin in the summer of 2012! 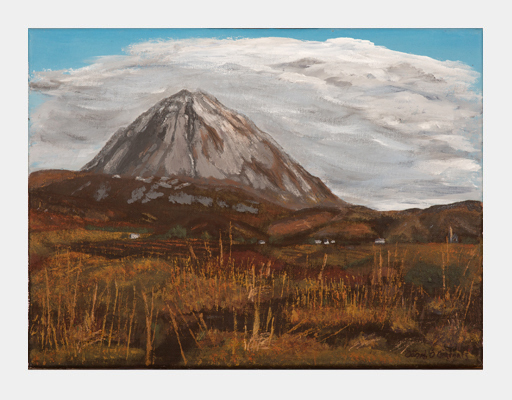 A Painting I did from my head while camping in the Donegal Gaeltacht. 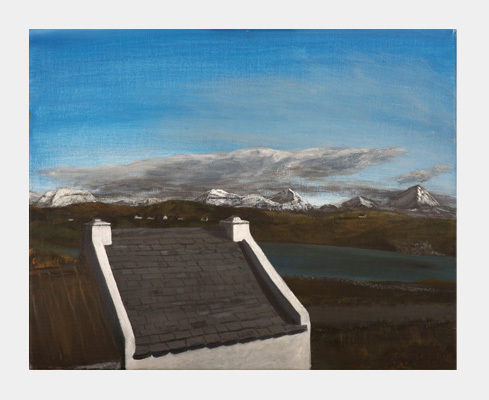 A Painting I did while we were on our honeymoon in Portree, Skye. We love going to the west highlands and love it so much we spent our honeymoon there. I love stopping in Oban and watching the ferryboats coming and going from the port town to the islands of Mull, Barra, Coll and Island to name a few. 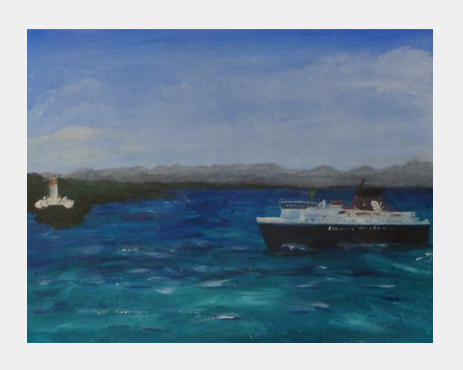 This one is the Isle of Mull passing by the Lismore lighthouse. 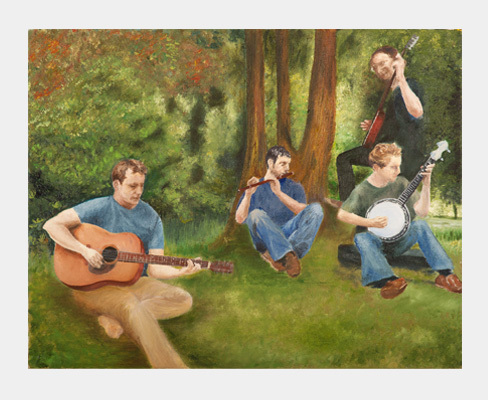 I like playing traditional music often in music sessions and now and again there’s a good picture that I’d like to capture on canvas. 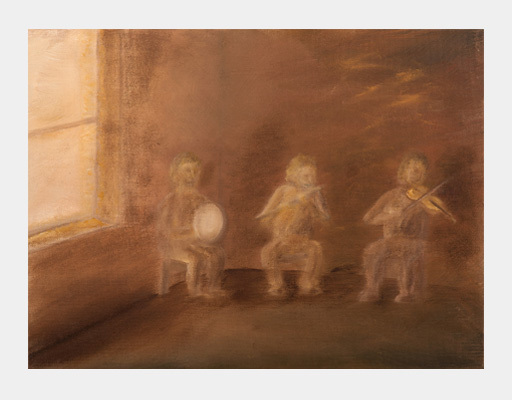 I painted different pictures with various musicians and instruments against a window with the light coming through it, with the atmosphere of a typical traditional Irish bar and a kind of abstract light, both for daytime and evening light in separate paintings. 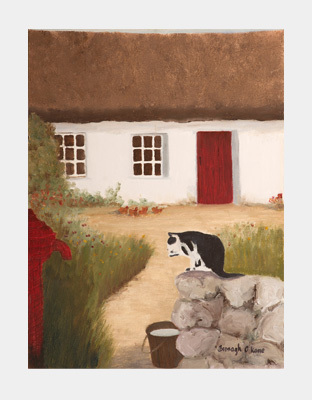 One of my first paintings i did from my head when i was in my teens, with a fictional cottage and a cat outside on the wall. This is my nephew Cathan playing with a ball when he was one year old. Starting on a lovely beach walk we were greeted with sunbathing cows at whitepark bay on the county Antrim coast. I met this little girl when my tour bus crashed on a mountain road in Laos. It seemed that her and her little brother and found our situation funny and i took a photo of her and painted her when i returned home. Although she seemed to have little she was happy. 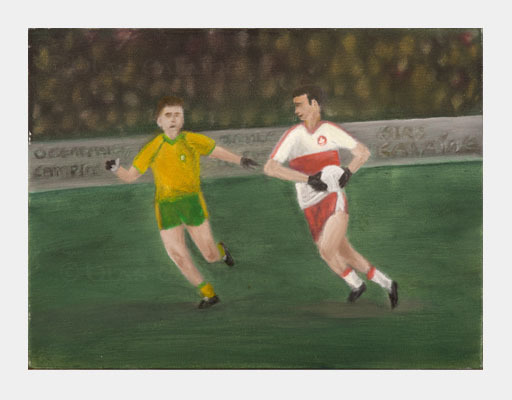 We were looking to paint a few paintings of Irish sports and we chose Football and Hurling. Here is Derry taking on Down in Hurling. It’s one of two paintings we’ve painted together. 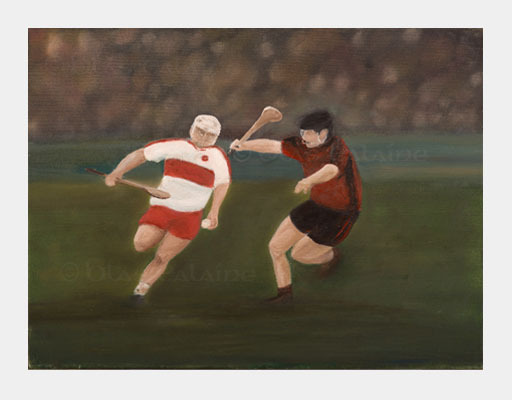 We were looking to paint a few paintings of Irish sports and we chose Football and Hurling. Here is Derry taking on Donegal in Gaelic Football. It’s one of two paintings we’ve painted together. Dermot took his dog Kasey to Port Arthur, County Donegal often. They have been camping in that area for years. Gola Island and Inis Meain are in the picture and Árainn Mhóir in the background, the place where it is though some of our ancestors came from. Karen took her dog Misty on a trip to Port Arthur, Gaoth Dobhair County Donegal while we were down for the Gaeltacht week. She has been going to that area every year with her family since she was young but that was Misty’s first time there with her. I took 3 or 4 photos and put them on canvas with oil. I took this photo on the back of Inis Meáin, County Donegal and we got there by canoe from camping on Port Arthur I was drawn to the contrast between the grey rocks surrounding the bright green algie laden rocks, wet from the recent tide. 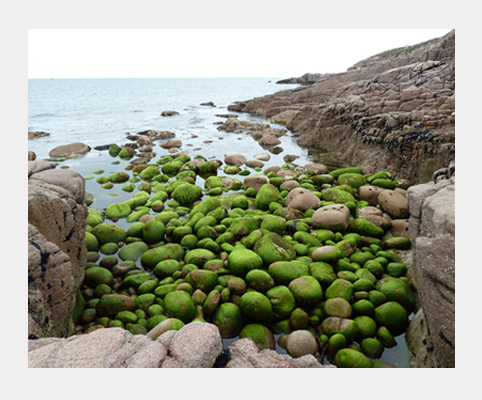 Intersting fact: In irish, rocks are sometimes referred to as green as opposed to grey (in English) because of the moss or algie on them. 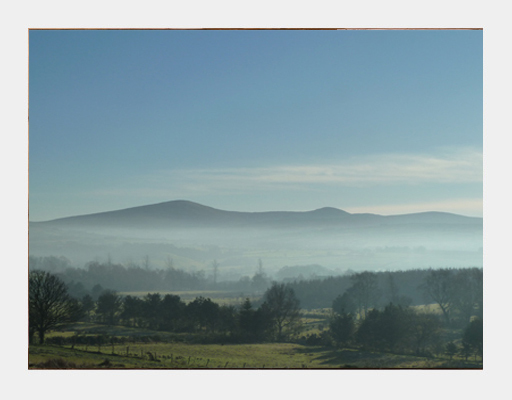 I took this photo from the Glenshane road, from my native County Derry on one of the many journeys I've made on that road to work in Belfast. 20% off during SNAG ! To celebrate Seachtain na Gaeilge we're discounting everyhing by 20% for all friends/followers of Blas Ealaíne on Facebook/Twitter (@blasealaine) between 1-17 March - like and share le bhur dtoil !